Meet a 5.1 array that marries smart design with serious sonics. Is the age of the floorstander coming to an end? Long-term readers will know I have talked about my love of speaker designers - as a gently bonkers breed all of their own - before. For instance, I’ve witnessed engineers almost come to blows during arguments about tweeters. You have to be deeply passionate about your job to get to that level. My fascination with the subject of loudspeakers also extends to the politics of speaker design and the way products are conceived. And this is where the Q Acoustics brand is a little bit odd. Instead of the traditional route, which is to get your superstar high-foreheaded designers to dream up superb cost-no-object technologies to incorporate into top-end models, and then let the technology filter-down to lower-cost products for actual bill-paying profit, the Q Acoustics people took a different tack. They focused their technical and design effort on the more affordable end of the market. Not just a meeting or two in a Chinese factory technology department to knock up a value-for-money speaker, but rather a flying leap at trying to offer something that was almost offensively better than it ought to be for the money in performance terms, and with a design that everyone would love. And while the first iteration of the Q Acoustics line of loudspeakers was generally lauded when it launched, this new series, dubbed 2000i, pledges to be even better. That is a necessity in today’s market. At this year’s Bristol Show, along side the hulking floorstanding arrays, I spied plenty of other brands clamouring for a slice of the upmarket sub/sat pie. They’ll have their work cut out, though, as the appeal of these loudspeakers isn’t just about their hi-fidelity, it’s their flexible installation options and smart design. 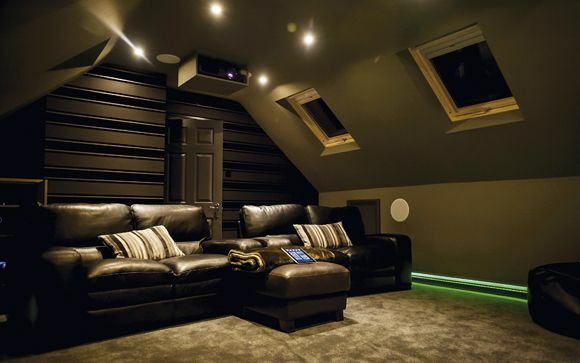 Dubbed the Q Acoustics 2000i Cinema Package, this £750 array collects together two pairs of the 2010i satellite speakers, one centre speaker (the 2000Ci) and one subwoofer (the 2070Si). There are no stands or brackets included, as the brand offers the optional 2000ST stand for the 2010i speakers. You can also get the 2000WB wall bracket, which swivels and angles up and down. All of the speakers sport a cute, curvaceous shape that doesn’t finish square at the bottom, like a normal cabinet, but is rounded. The cable connection is clever, in that there is a recess actually underneath the speaker housing the high-quality binding posts/banana plug sockets. They are in a staggered position, so that your cables turn a corner as they connect. On the 2010i and the 2000Ci centre there is one set, but underneath the step-up 2020i satellites or bigger 2050i floorstanders (because Q Acoustics knows that some of you will always want larger speakers), you get a second pair for bi-wiring. This tucked-away approach does make initial wiring a bit tricky, but it means the speakers’ smooth surfaces remain unmolested, with just the curved port to see on the back. My review sample was finished in gloss white. Other options are gloss black, graphite or walnut - the latter two are less expensive options that will knock approximately £110 off the package price. The centre is essentially a longer, sideways version of the 2010i (but with an additional midbass driver). The woofer, on the other hand, is dead odd. Firstly, it is suitcase- rather than cuboid-shaped. Secondly, it is also the child of the same designer who likes simple curves and utterly clean lines. It just looks like a larger version of the satellite speakers. However, this sub is a lot more cunning than it might seem, using a pair of vertically-stacked 6.5in cones, each independently driven by a 75W Class D amp, to maintain its slender dimensions. Controls include continuously variable phase adjustment and phase invert, crossover, a Sound Mode selector between Music and AV, and Speaker Type (sealed or vented) for use with a stereo setup. There’s a hefty dollop of digital signal processing (DSP) lurking inside that makes this product swan-like – beautiful, white and elegant on the surface but paddling like fury under the water line. The DSP controls the level of bass produced at the crossover frequency, and the manual, while carefully written to be understandable, goes deeper into how to really set this subwoofer up than most makers even hint at. Admitting it can take hours of listening and basically telling you to experiment. Thankfully, I have installed a lot of subs and seen a few plots of what goes on when woofers are in my room, so I didn’t find it too hard to get a good result. With the array set up and ready to rock, I put began with a multichannel DTS CD. Well, a few in fact, as from Studio Voodoo to Linkin Park and even Boys II Men, I was gently impressed. These speakers are remarkable performers. The sound was fuller and richer than I was expecting it to be, as one buys floorstanders for largescale sounds. Yet even these smallest models, with the 4in midbass drivers all round, offered an impressive, fat performance. The snap, attack and punch was remarkable as well – it’s clear the transducers are a bit special. The paper cone midbass units tote a fancy ceramic-coating, but it’s the high-frequency drivers that are the key. The tweeters are ferrofluid-cooled and decoupled from the rest of the cabinet to avoid unwanted vibrations. Q Acoustics says they will reach up to 22kHz. I put The Adventures of Tintin... in my Blu-ray player and revelled in the fabulous clarity, definition and intelligibility of this set. The stylish subwoofer drops deep and grips the bass, proving that there are alternative approaches to a single dustbin-lid-sized driver. The film’s jazz-infused intro music was so delicious, with bell trees tinkling and brushed cymbals. In fact, John Williams’ score is perfect to show off this package’s strong points, with instruments’ edges and tones all distinct. In an early sequence when our hero is doing research, a crack of thunder did find the sub’s limit, but that’s to be expected at this price point. If you want truly subterranean levels you’ll need to increase your budget considerably. Overall this is a truly remarkable set and utterly recommended. I’d spend my own cash on these – and probably opt for the gloss white, too.